Looking for an optimal way to transfer store data from VirtueMart to Magento? We are here to help you. Why is it the best possible option? Simple point’n’click migration wizard will help you to move products, clients and orders information without applying any technical skills. Migration process is fully automated so it won’t take more than a few hours to transfer your store. 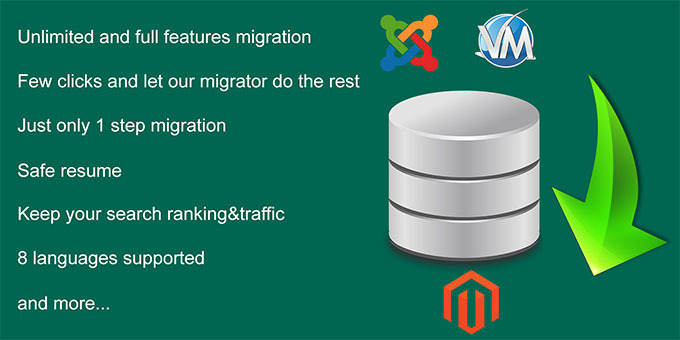 Currently on the market there are also some extensions to allow do migrate from Virtuemart to Magento. But the cost is quite high and limited to the amount of data, also not easy to implement. With our plugin, you can migrate unlimited amount of data, and with just 1 page, it's very simple to do your job. A few clicks then enjoy a cup of coffee and work done. We guarantee that you just need to pay one time only for unlimited use. Not like other tools on the market, which charges you a lot of extra money for their unlimited edition, our tool already has no limits itself (unlimited entities, customers passwords, migrate SEO Urls,…) Buy it for once, use it for lifetime! We provide clear and easy instructions to guide you through migration process . You do not need technical knowledge and just need to click a few times and then our migrator will automatically do the rest. It’s easy and simple to save your time, just only 1 step to migration, not to a new page, without the knowledge of technology. With our tool, you will not have to worry about sudden server shutdown, network down or any other cause. Our migrator provide safe resume from the last restoring point, and you will not have to start over again. Our tool will maintain all existing links of products and categories. Therefore, your SEO rankings will remain unchanged. You’re having trouble in migrating customers password from VirtueMart to Prestashop because they are encrypted specifically? This feature is extremely helpful to migrate customers password. If you are not proficient in English, do not worry, we supports 8 most common languages in the world, help you to have a look easier and happier.